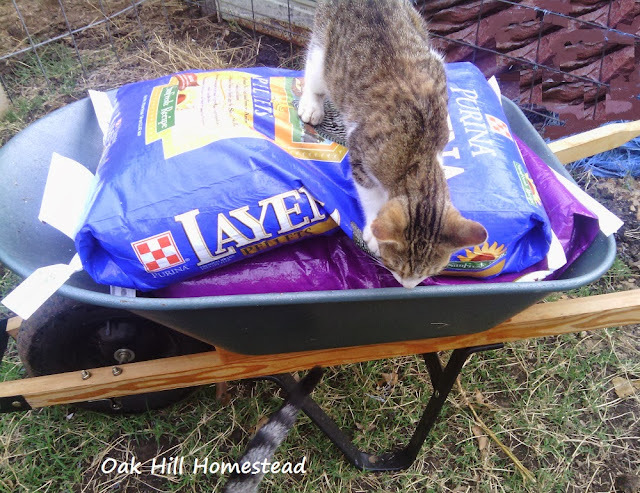 -- Rusty, one of the teenage kittens, is the only cat we've ever had who actually enjoys riding in the wheelbarrow. I "plonked" him in it one day to move him safely out of my way as I pushed it, but he enjoyed it so much that I put him in the next time, and the next; now he insists on riding on top of my load and jumps in on his own. -- This weekend, if you live in the United States, we will change the clocks back to Standard Time. This is when hubby changes the batteries in our smoke detectors, which means it's time to buy the batteries. 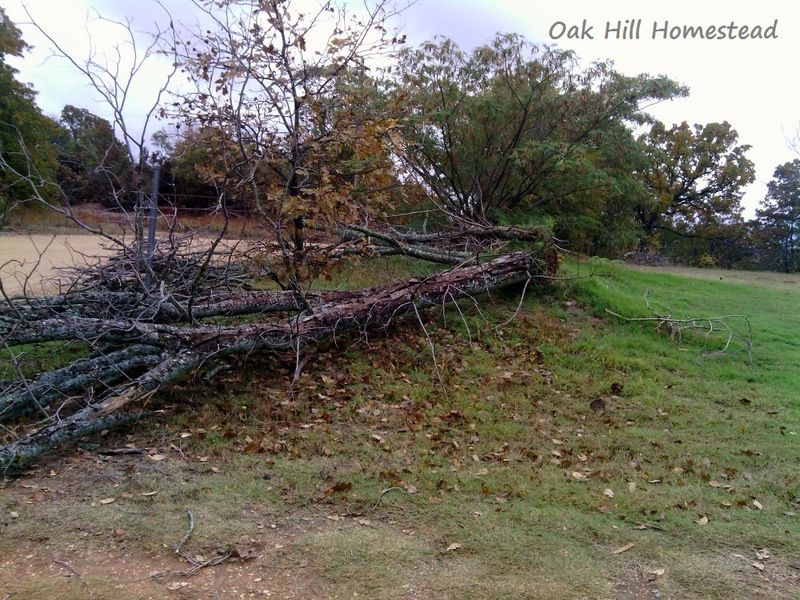 -- In Wednesday's storm, we lost the rest of the dead mimosa tree. When we moved here, there was a huge, lovely tree that we drove underneath to get to our front gate. A few years later it was hit by lightning, and has fallen piece by piece until this week when the last trunk fell. At least this one only blocked off our driveway instead of the road. 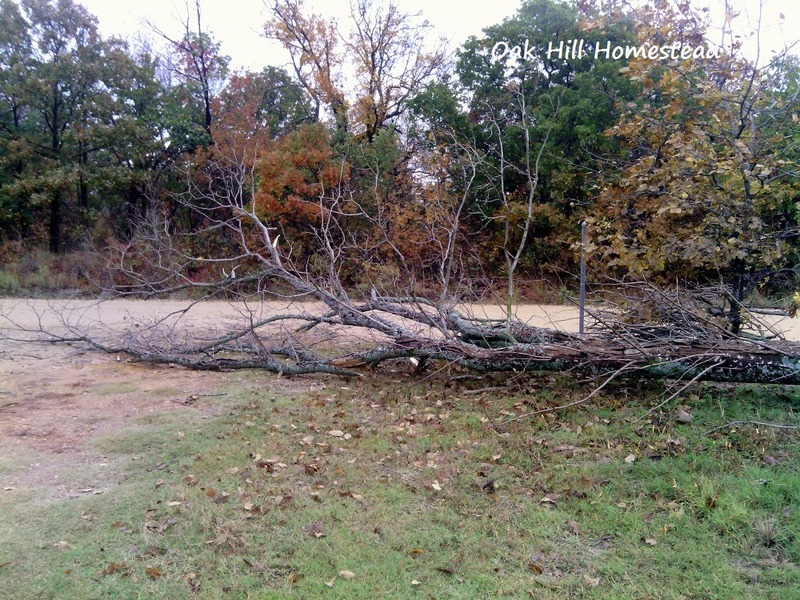 I broke off as many branches as I could that hung over the road so it wouldn't be a hazard to passing vehicles, and hubby took care of the rest with the chain saw when he got home. It looks so bare and open out there now from my kitchen window; I miss the sense of privacy that even the dead trunks used to give me. -- Fall finally happened on Tuesday. I was outside between the bands of rain on Wednesday taking as many pictures as I could; I was afraid all the leaves would fall off in the wind and rain before I could capture them on film. -- In the kitchen: I've been baking pumpkins for puree, roasting the seeds for hubby, straining homemade vinegar, making gingerbread. I love fall. I'm so sorry about your Mimosa. :( But, they are incredibly easy to plant & grow. Lol, in fact, my (then) husband used to mow mine down, because he 'didn't see them'. 3 of the original 5 my girls & I planted kept coming back, anyway! Next mowing season, I pounded 3 rebar posts around the 3, & they grew so fast! In 4 yrs time, they went from 12" babies, to 3" stubs - repeatedly - to about 10 feet tall! You could have that empty space filled & summer blossoms in very short order - lol, IF that's what you want, but me? I miss mine enough that I'd plant a whole stand of 'em! I love fall as well. We live on the Atlantic and there are 3 pine trees between us and the beach. As much as I wish they weren't there to block part of the view I would miss them if they were gone. You must have a beautiful view!